Go to WooCommerce > Settings. And select ‘Auction’ tab. Select ‘Display’ section. You will get an interface like the image below. Do not display auctions on shop page – Check this if you want the auction products not to be displayed in shop page. Do not display auctions on category page – Check this if you want the auction products not to be displayed in category page. 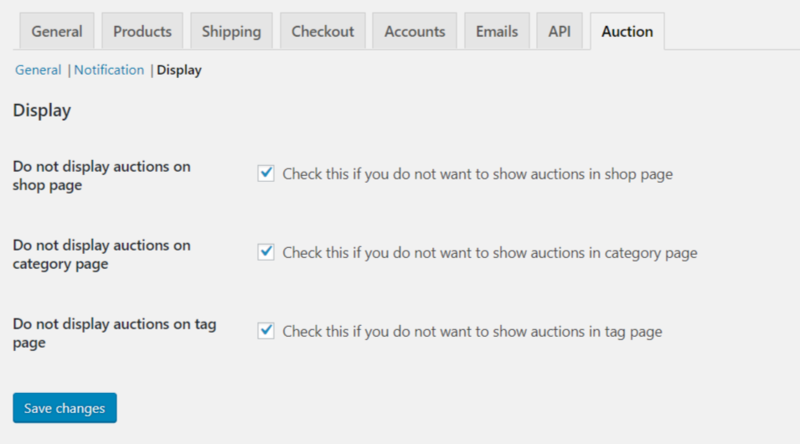 Do not display auctions on tag page – Check this if you want the auction products not to be displayed in tag page.